In a large skillet over medium heat, combine Italian dressing, rice, and onion. Stir until mixture is coated with dressing and let toast for 5 minutes or until rice golden brown and onions become translucent. 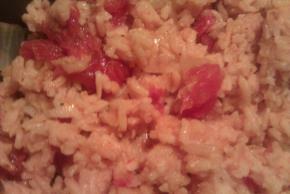 Add stewed tomatoes along with the liquid from can and stir in. Then, add chicken stock and freshly cracked black pepper to taste. (At this time you may add in a dash or 2 of cayenne pepper if you want to add more heat). Bring mixture to a boil then reduce heat to medium-low and let simmer for 15 minutes. However tempting it may seem, do NOT lift lid. Your rice will not stick to the bottom of the pan. If you want to be sure, hold the lid in place and give the pan a gentle shake. Remove from heat and let stand for another 10-15 minutes or until liquid is completely absorbed. Fluff with fork, serve hot, and enjoy.